Scimitar syndrome is characterized by anomalous drainage of the right pulmonary veins into the inferior vena cava (IVC). It may also be associated with hypoplasia of the right lung, dextroposition of the heart, atrial septal defect, and anomalous systemic arterial supply to the right lung. This report focuses on the surgical repair achieved in the setting of an unusual anatomy of the scimitar vein. 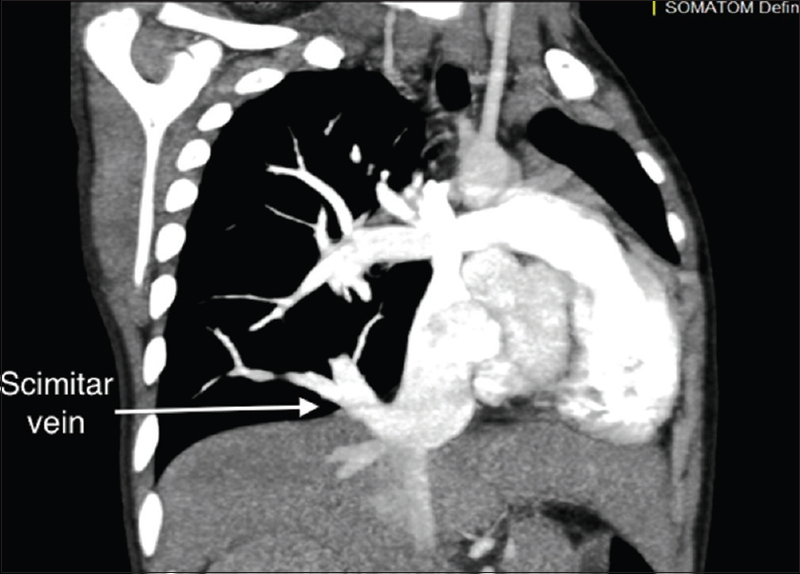 An 11-year-old boy presented with a history of tachypnea and recurrent respiratory infections. Echocardiogram revealed anomalous drainage of the right pulmonary veins into the infradiaphragmatic portion of the IVC. There were no other intracardiac anomalies and the interatrial septum was intact. Computed tomography scan of the chest identified the scimitar vein and its course within the parenchyma of the right lung. The extraparenchymal portion was short and was joined by the right lower lobar vein immediately adjacent to its exit below the diaphragm [Figure 1]. Through median sternotomy and transpleural approach, the intraparenchymal nature of the vein and its course were appreciated. The extraparenchymal portion of the vein was 1 cm long prior to its exit through the diaphragm. The drainage of the right lower lobe vein in close proximity to its exit was also confirmed. The scimitar vein was in addition, located posterior to the hilum of the lung and, therefore, distant from the left atrium. The IVC was mobilized widely by incising its diaphragmatic attachments. Cardiopulmonary bypass was instituted and at 18°C deep hypothermic circulatory arrest was established. The venous cannula was removed and the IVC was transected at the cavoatrial junction beveling the incision anteriorly to create a hood. The orifice of the scimitar vein was identified through the transected IVC. A patch of bovine pericardium of appropriate size was used to baffle the scimitar vein; thereby, partitioning the IVC into a posterior pulmonary and an anterior systemic venous chamber [Figure 2]a. At the cardiac end, the transected cavoatrial junction was incised vertically and posteriorly into the left atrium. The interatrial septum was thus incised. The fossa ovalis was excised completely, thereby, creating a large atrial septal defect [Figure 2]b. The posterior wall of the transected IVC was anastomosed to the posterior margin of the left atrium. The previous patch of bovine pericardium was then utilized to close the surgically created atrial septal defect, thereby, baffling the scimitar vein into the left atrium[Figure 2]c. The anterior aspect of the transected IVC was next incised longitudinally toward the diaphragm beyond the level of the orifice of the scimitar vein. The beveled hood at the anterior aspect of the cardiac end of the cavoatrial junction was anastomosed to this incision on the IVC, thereby, enlarging the chamber that was compromised by the partition created earlier. The circulation was reestablished, the child was rewarmed and weaned off cardiopulmonary bypass uneventfully. Transesophageal echocardiogram showed laminar flows in both the systemic and pulmonary venous chambers. Follow-up echocardiographic evaluation at 6 months confirmed smooth flows in both the chambers [Figure 3]. Scimitar syndrome is a rare congenital cardiac anomaly comprising two per 100,000 live births. 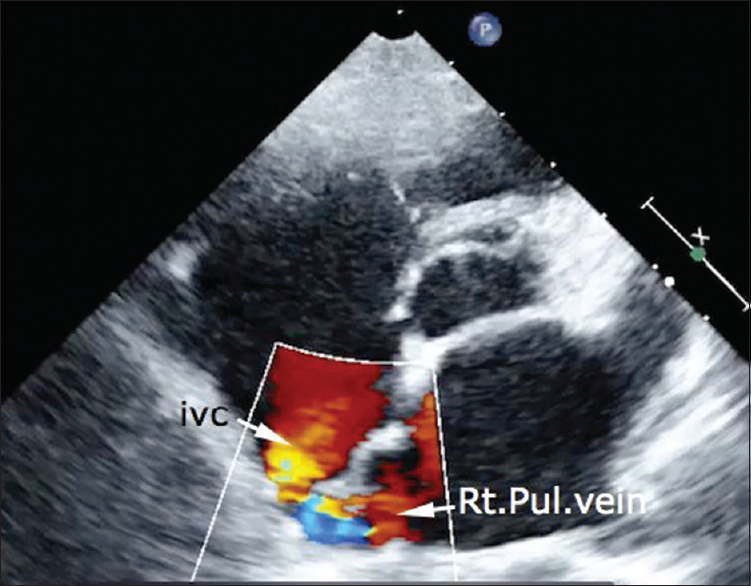 The anomaly is associated with varying levels of drainage of the scimitar vein into the IVC. Several methods of repair have been described for routing the scimitar vein to the left atrium.,,,,, Surgical repairs are broadly categorized as baffle repairs and repairs involving implantation of the scimitar vein into the left atrium. Implantation may be performed either directly or by interposition grafts of polytetrafluoroethylene. The anatomical course of the scimitar vein, its site of drainage into the IVC, presence of interatrial communication, and the presence of other intracardiac anomalies determine the choice of surgical repair. Our patient had an extremely short length of scimitar vein outside the parenchyma of the lung besides an unusually low drainage of the lower lobar vein. In addition, the scimitar vein lay posterior to the hilum and distant from the left atrium. This precluded a direct implantation. The conventional baffle repair would also have been suboptimal in this situation given the intact atrial septum and the infradiaphragmatic drainage of the scimitar vein into the IVC adjacent to the orifices of the hepatic veins. This procedure originally described by Calhoun and Mee is easily reproducible and achieves good anatomical repair. It is particularly useful in the setting of a short extraparenchymal segment of the scimitar vein located posterior to the hilum with infradiaphragmatic drainage of the vein into the IVC in the presence of an intact interatrial septum. Brown JW, Ruzmetzov M, Minnich DJ, Vijay P, Edwards CA, Uhlig PN, et al. Surgical management of scimitar syndrome: An alternative approach. J Thorac Cardiovasc Surg 2003;125:238-45. Tornvall SS, Jackson KH, Alvayay JC, Vargas AC, Koch W, Zarate E. Anomalous drainage of the pulmonary veins into the inferior vena cava. Report of an operation. J Thorac Cardiovasc Surg 1961;42:413-7. Honey M. Anomalous pulmonary venous drainage of right lung to inferior vena cava (”scimitar syndrome”): Clinical spectrum in older patients and role of surgery. Q J Med 1977;46:463-83. Shumacker HB Jr, Judd D. Partial anomalous pulmonary venous return with reference to drainage into the inferior vena cava and to an intact atrial septum. J Cardiovasc Surg (Torino) 1964;5:271-8. Zubiate P, Kay JH. 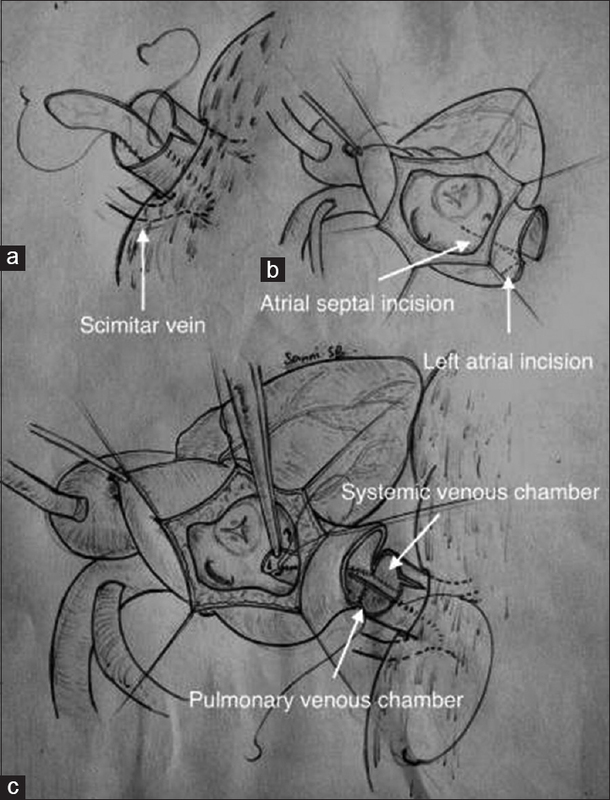 Surgical correction of anomalous pulmonary venous connection. Ann Surg 1962;156:234-50. Puig-Massana M, Murtra M, Revuelta JM. A new technique in the correction of partial anomalous pulmonary venous drainage. J Thorac Cardiovasc Surg 1972;64:108-13. Calhoun RF, Mee RB. A novel operative approach to scimitar syndrome. Ann Thorac Surg 2003;76:301-3.